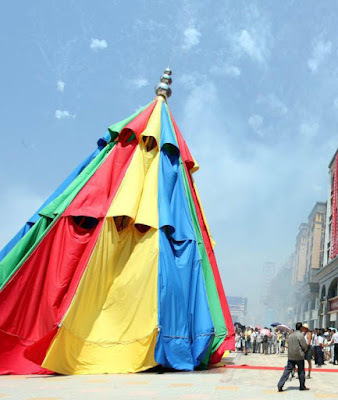 A giant umbrella of around 23 meters in diameter and 14.4 meters in height made by a Chinese firm on Monday set a new Guinness World Record for the world's largest umbrella , breaking record set in India in 2010 . 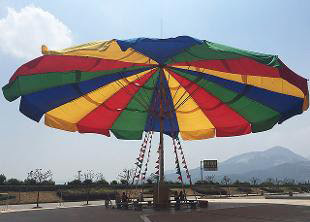 The umbrella weighing 5.7 tonnes (5,700 kg) and covers an area of 418 square meters . Previous world record was held by an umbrella with 17.06 meters(56 ft) diameter and 10.97 meters(36 ft) height in India in 2010 . It weighed 2,200 kg . It was made by Max New York Life Insurance (India) and was unveiled at Ishanya Mall at Pune, India, on August 14, 2010. Thanks for sharing this such magnificent blog actually very interesting keep composing for a kind blog.